In a different way. Sing your death song and die like a hero going home." Tecumseh (/tɛˈkʌmsə/; March 1768 – October 5, 1813) was a Native American leader of the Shawnee and a large tribal confederacy (known as Tecumseh's Confederacy) which opposed the United States during Tecumseh's War and the War of 1812. Tecumseh has become an iconic folk hero in American, Aboriginal and Canadian history. During the War of 1812, Tecumseh's confederacy allied with the British in The Canadas (the collective name for the colonies of Upper Canada and Lower Canada), and helped in the capture of Fort Detroit. American forces killed Tecumseh in the Battle of the Thames, in October 1813. With his death, his confederation disintegrated. Some tribes simply stopped fighting. Accordingly, the British deserted their Indian allies at the peace conference that ended the War of 1812. As a result, the dream of an independent Indian state in the Midwest vanished, and American settlers took possession of all the territory south of the Great Lakes, driving the Indians west or into reservations. Tecumseh (in Shawnee, Tekoomsē, meaning "Shooting Star" or "Panther Across The Sky", also known as Tecumtha or Tekamthi) was born about March 1768. His birthplace, according to popular tradition, was Old Chillicothe (the present-day Oldtown area of Xenia Township, Greene County, Ohio, about 12 miles (19 km) east of Dayton). 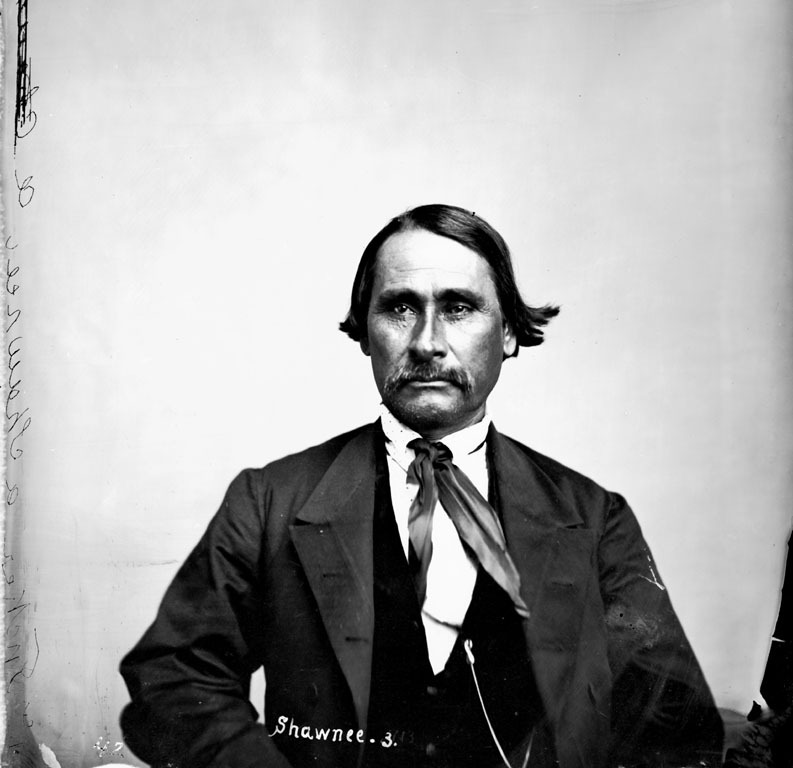 As Old Chillicothe was not settled by the Shawnee until 1774, it is believed that Tecumseh may have been born in a different "Chillicothe" (in Shawnee, Chalahgawtha), which was the tribe's name for its principal village, wherever it was located. Tecumseh is believed to have been born in Chillicothe along the Scioto River, near the present-day city of Chillicothe, Ohio, or, maybe, in another village the Kispoko had erected not far away, along a small tributary stream of the Scioto, where his family moved just before or not long after his birth. 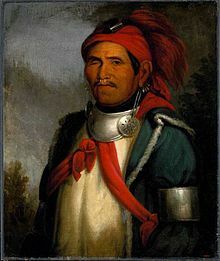 When Tecumseh was a boy, his father Puckshinwa was "brutally murdered" by white frontiersmen who had crossed onto Indian land in violation of a recent treaty, at the Battle of Point Pleasant during Lord Dunmore’s War in 1774. Tecumseh resolved to become a warrior like his father and to be "a fire spreading over the hill and valley, consuming the race of dark souls." At age 15, after the American Revolutionary War, Tecumseh joined a band of Shawnee who were determined to stop the white invasion of their lands by attacking settlers' flatboats traveling down the Ohio River from Pennsylvania. In time, Tecumseh became the leader of his own band of warriors. For a while, these Indian raids were so effective that river traffic virtually ceased. "No tribe has the right to sell, even to each other, much less to strangers.... Sell a country! Why not sell the air, the great sea, as well as the earth? Didn't the Great Spirit make them all for the use of his children? The way, the only way to stop this evil is for the red man to unite in claiming a common and equal right in the land, as it was first, and should be now, for it was never divided." Brothers -- My people wish for peace; the red men all wish for peace;but where the white people are, there is no peace for them, except it be on the bosom of our mother. Where today are the Pequot? and many other once powerful tribes of our people? They have vanished before the avarice and the oppression of the White Man, as snow before a summer sun." The name Curse of Tippecanoe (also known as Tecumseh's Curse, the Presidential Curse, Zero-Year Curse, the Twenty-Year Curse, or the Twenty-Year Presidential Jinx) is used to describe the regular death in office of Presidents of the United States elected or re-elected in years divisible by twenty, from William Henry Harrison (elected in 1840) through John F. Kennedy (1960). Ronald Reagan, elected in 1980, was shot and survived; George W. Bush (2000) survived an attempt on his life unharmed.